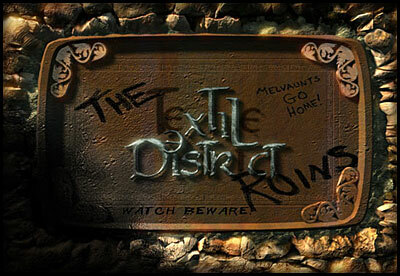 This district is no longer the wreckage it used to be. The former Textile District is where the city wall was breached during the Melvaunt invasion twenty years ago and it experienced the most brutal fighting. As a result, most buildings were razed to the ground. The district was later reclaimed for the city, and the breach repaired. Freed from the threat of the invaders, many refugees from the war have returned to occupy and rebuild the area. Along with them, numerous immigrants from all over the Moonsea have come to live in the section, attracted by the offer of steady jobs and a promising future. That has not come without trouble. The majority of the current inhabitants of the Western Ruins are of the poor extraction and the mixture of older Phlanites and newcomers puts a strain on the daily life of the district as racism and xenophobia flare.The situation has turned explosive in the case of the relatively large community of migrants from Melvaunt due to the history of conflicts between the two cities. The Melvauntians lived in a kind of unwalled ghetto, and in the past years they have been subject to pogroms for just about any reason. The situation has gotten much better lately and the living standards have improved, along with regular patrols by the Waiting, the Temple of Tyr. In the past, the need for the Melvauntians to self defense has produced a violent gang, named The Good Folk. It has been largely eradicated in the recent years, their remaining members, it is said, integrating into the mainstream society as traders. 1. The Cadorna Mills. The Cadorna family is recovering from old scandals and is rebuilding itself while recapturing the textile market in town. Marselith’s dye shop (for just that purpose) is open to the public. 2. The Soup Kitchen. While the Western Ruins are looking much better than they used to, the Ilmaterite Mission here welcomes all, and orphans still tend to wind up here, either to be given a trade or to drift into one of the local “urchin gangs” established with the local school and its orphanage. 3. The Jadie Company. The merchant-wizard-and-also-bard-and-other-things Fadra Jadie has been very active in the Western Ruins, engaged in business and charitable work, and is currently known to be basing an airship (!!!) from the District (under incredibly heavy guard). 4. The Stoneshaper Compound. The Stoneshaper Clan has a defensive alliance with Phlan, and dwarven affairs are regularly dealt with here. 5. The Tormite Shrine. Bordering on the Artisan’s District, the Shrine is small and somewhat-active, though its members tend to pursue less of its patron’s war against Bane as to focus on generally aiding the good of the region. It also houses a semi-secular school with its teachers being drawn from all ways of life and expertise. This being the Moonsea… people need the help, and a Tormite Paladin is one of the very few one trusts not to have ulterior motives when offering aid.